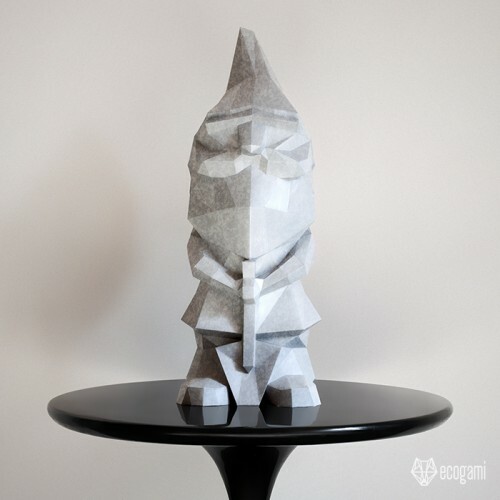 Make your own (not dorky) papercraft garden gnome with our printable PDF pattern! It’s easy! Just follow the template & you will be proud of your low poly humanoid creature. Isn’t it a nice & unique decor for your sweet home or even a gift for a dwarf collector? Well, this (garden) gnome doesn’t like the rain but as it is more cool that the other garden dwarfs, it will fit perfectly with your interior design! ► Difficulty Level: Medium – Few parts require more patience and attention (like the mustache, the shovel & its joystick).